Rotork has demonstrated its ability to be a one-stop shop for valve actuation products and services for an oil storage tank expansion project in Holland. Rotork's activities have encompassed the supply of intelligent electric actuators for isolating, modulating and failsafe valves, digital control systems, valve gearboxes, valve adaptation, workshop motorisation, on-site retrofitting and commissioning. 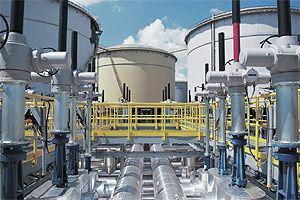 Royal Vopak is the world's largest independent provider of tank terminal capacity for the oil and chemical industries. An expansion project at the Vopak Oil Europoort Terminal will increase the total storage capacity to approximately 1.2 million cubic metres by 2012, strengthening the company's position as an independent bunker station in the Port of Rotterdam. Phase 8 of the expansion project involves the construction of four new 40,000 cubic metre capacity fuel oil tanks, a pump pit with manifolds, which connect the tanks to each other and to the rest of the terminal, and an OCU (Odour Control Unit) which is the fourth to be installed on the site for environmental improvement. Rotork is the holder of a valve actuation framework agreement with Vopak and has supplied more than 1500 actuators, the majority with Pakscan two-wire digital control systems, on the existing Vopak site. In Phase 8 of the expansion project the client wanted to adopt the same advanced valve actuation technology and seamlessly dovetail it into the existing plant control structure. In addition to the supply of new equipment, the client also required a number of additional specialised and support services in a contractual package that illustrates many aspects of Rotork's group capabilities. Technically, Rotork IQPro intelligent electric valve actuation with Pakscan two-wire digital control has been adopted for the majority of valve duties throughout the existing facility. Therefore, the bulk of the new valves in Phase 8, totalling 111 on-off installations, have also been motorised with IQPro actuators. These include gate valves in sizes up to 24 inches on the manifolds and butterfly valves on the OCU lines. IQPro actuators are designed for maximum reliability with enhanced functionality, featuring non-intrusive, intrinsically safe commissioning, data logging and predictive maintenance capabilities. A large and comprehensive user display on the actuator's double-sealed IP68 watertight and explosionproof enclosure is the interface for actuator setting, commissioning and interrogation by means of a hand-held setting tool. The illuminated window displays point-and-shoot setting menus, prompts and confirmation of setting data, local and remote control status and additional data including valve torque/position profiles. The hand-held setting tool, featuring bi-directional infra red communication, facilitates on-site actuator configuration with or without mains power connected. Bidirectional communication enables data to be retrieved and retransmitted to other actuators, offering the ability to save time and cost when many valves require near-identical commissioning. In addition, actuator data logger files can be downloaded and transported from plant to office for storage and analysis on a PC running Rotork IQ-Insight software. The Pakscan digital network can also be used for this function, enabling data retrieval to be performed in the comfort of the control room. Effective asset management programmes can then be planned and implemented, maximising plant utilisation and minimising the risk of unexpected process interruptions. Vopak Project Manager Cees Brijs comments: "We have been using Rotork actuators for a long time throughout the terminal and find them to be of good quality. In addition, if there is a problem, the response time from Rotork is very swift." Swift response is assisted by the nearby presence of Rotork Holland's offices and recently enlarged workshops. These facilities have also assisted with the supply of motorised valves for the Phase 8 project by enabling some of the valves to be free-issued to Rotork, fitted with actuators and tested in the workshop before delivery to site as completed packages. In addition, experienced engineers from Rotork Site Services have been available to fit actuators to valves on the site when this has been seen to be the best solution, providing additional flexibility to suit the logistics of the contract. The 111 new IQPro actuators installed on Phase 8 are linked on two new Pakscan master station networks for communication with the Rockwell PLC that controls the operation of the plant. The new master stations dovetail into the twelve existing Pakscan master station networks that are in service throughout the existing plant. Once again, the local availability of specialised Rotork Site Services engineers has assisted the project through swift final commissioning of the new actuators and Pakscan networks. Pakscan is a digital control system designed specifically for valve actuators and has actuator focused features that are unavailable from other designs. For example, the capacity for up to 240 actuators on a fault tolerant field network, up to twenty kilometres long without repeaters, is an important reliability and economic consideration in the spacious environments storage tank farms. Repeaters require separate power supplies, can slow the data transmission speed and introduce a single point of failure. The failure of a repeater will result in loss of communication with all downstream field units. Pakscan also provides dual host communication paths as standard and has the ability to isolate any field based fault without interrupting communication with other units on the loop. In fact Pakscan's configuration provides built-in redundancy in every area - from the valve to the control room - ensuring that vital information for the host controller on valve position, status and condition is as secure as possible. In addition to the predominant area of supply involving IQPro actuators from Rotork Controls, some specialised areas of actuation duty have been fulfilled with equipment from other divisions within the Rotork organisation. For example, Rotork Gears has supplied IS range spur gearboxes with stem extensions to enable double block and bleed valves to be conveniently operated from a nearby mezzanine walkway. 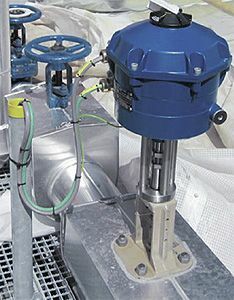 Rotork Fluid Systems has supplied Skilmatic SI/EH range electro-hydraulic failsafe actuators for safety-related duties. These compact and robust actuators deliver a highly reliable means of valve management and positioning a valve to a safe condition, selectable for failsafe to open, failsafe to close or lock in position on power failure or emergency shutdown (ESD) signal. Based on Rotork IQPro intelligent actuation technology, the Skilmatic SI/EH control module facilitates the same simple, safe and swift non-intrusive commissioning by means of a hand-held setting tool. Settings including internal hydraulic pressure, valve position, position limits, control, alarm and indication functions can be accessed and adjusted using user-friendly point-and-shoot menus. Actuator status, control and alarm icons are provided on the illuminated LCD display, which also gives access to real-time information, help screens and diagnostics. Designed to SIL3 standards for use on safety critical applications, the actuators are also capable of partial stroke testing, something of particular importance on ESD applications. During the project a problem was identified with some installed control valves in the boiler house that provides heating for the storage tanks. The 6 inch valves were equipped with linear electric actuators that had proved to be incapable of fully closing them at full differential pressure. 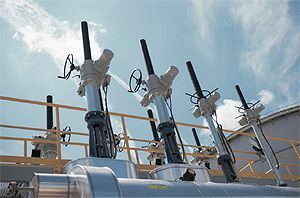 Furthermore, the actuators operated from a 0 -10V control signal that is non-standard for the industry and required an engineer from the manufacturer to be flown in to commission them as the valvemaker was unable to do this. Other problems included the mounting of limit switches on the exterior of the enclosure, where they were vulnerable to damage, a nitrogen gas filled enclosure design that made maintenance very difficult and junction boxes that were judged to be not robust enough. The situation gave Rotork Process Controls the opportunity to offer its CVA product, leading to the first substantial order from Vopak for this innovative control valve actuator. The CVA electric actuator provides extremely precise control valve operation with repeatability and resolution performance at less than 0.1% of full scale. In addition to the convenience of all electric control and operation, the CVA uses Rotork's non-intrusive communication technology for swift and user-friendly actuator set-up, auto calibration and adjustment. Further benefits include comprehensive performance data-logging, a double-sealed explosionproof and IP68 watertight enclosure for environmental protection and programmable fail-to-position options using integral super-capacitors. The CVA data logger stores operational data such as valve torque profiles, events and statistics that can be downloaded for detailed analysis using Rotork Enlight software. By anticipating potential problems, preventative maintenance can be planned without interruption to the operation of the plant. Four CVL1500 linear actuators have been ordered for retrofitting to the installed control valves by engineers from Rotork Site Services. 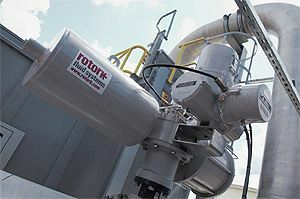 Rotork's responsibilities included the design and fabrication of new adaptation between the CVAs and valves, which has been performed by Rotork Valvekits, the specialist valve accessory company in the Rotork Group. 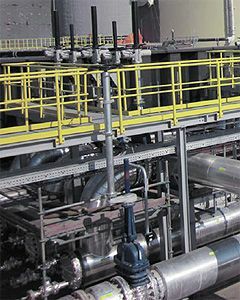 The customer used Rotork as the single source for all the valve actuation and control elements of the plant expansion project, simplifying the overall contractual process. In addition to the supply of new equipment, Rotork was able to provide factory motorisation, on-site retrofit, installation and commissioning services, assisted by the local presence of a fully trained and experienced workforce and comprehensive workshop facilities. Using the same Rotork intelligent actuation technology as was already established in the existing plant was a logical solution that enabled the new plant to seamlessly dovetail into the existing control protocol. As a part of this, the additional Pakscan two-wire digital control systems were economical to install and integrate with the existing Pakscan network. Rotork group product expertise was available to advise on and provide successful solutions to specific actuation issues that arose, such as the installation of CVA actuators to replace unreliable control valve equipment.